What is it that makes history interesting? What is it that brings history to life? I suppose that is for each person to decide, although for many, there is nothing about history that is interesting. To them, history means a bunch of boring facts, figures, dates and names, along with dusty museums and static displays with “Do Not Touch” signs. To me, what makes history interesting is the people: Their stories; their motivations; the challenges and adversity they faced and overcame—or didn’t overcome; and the result. Take the story related in Three Area Soldiers. One Epidemic. Three Graves that appears on my Clare County history blog. It’s the story of Ervin Reed, James Garrity and Arthur Looker, three area men who enlisted in the service during in WWI and within just months of enlisting, were dead. Reed enlisted first in the National Guards; Garrity and Looker were cousins and enlisted together in the Navy the following year. I ran across the gravestones of Reed and Garrity in a small, partly overgrown cemetery in the northeast corner of Clare County’s Hamilton Township. 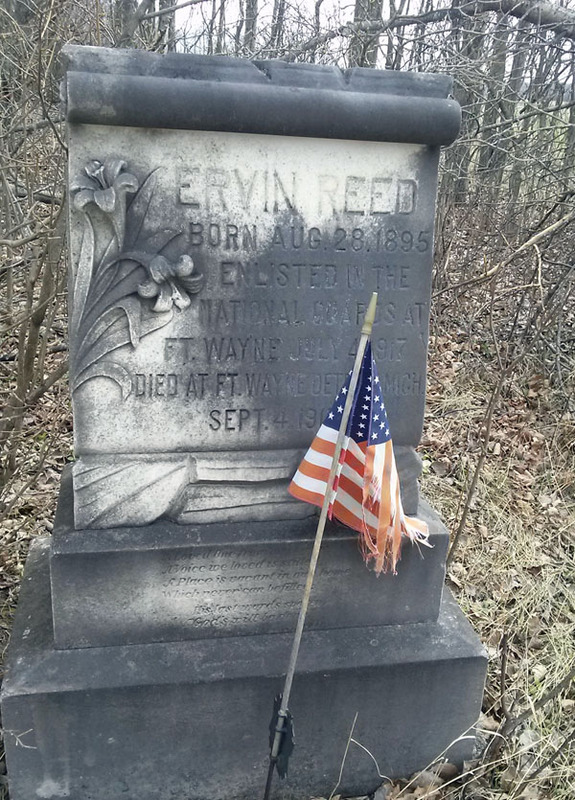 I had stopped there to get an idea of the work required to clean up the cemetery, and had noticed the two discolored gravestones and metal flag holder with flags that identified the graves as those of military personnel. Then I noticed the dates of enlistment and the dates of death. I was saddened and intrigued. The thought of a small community losing two men in such a short time and not long after enlistment got me wondering. What had happened to them? Why had they died ? And from what? Their tombstones seemed to indicate they had not even left the states. Returning home, I pulled up the Find A Grave, a national database that provides information on the dead. While not all deceased individuals are found on the site, and the amount of information can vary from grave to grave (it depends on what data the volunteer chooses to enter), there was a wealth of information on Garrity and Reed, including their two obituaries. It was from those obits I learned that Garrity had enlisted with his cousin Arthur, who died one day before James and at the Great Lakes Naval Training Station in Illinois. It was also from the obits that I learned that all three had died from pneumonia. Now I have always considered pneumonia a killer of the elderly and something that is treatable. Plus, I thought, what was the odds of three young farmboys all dying of pneumonia? 1) Back in 1917, we didn’t have antibiotics to deal with bacterial infections like pneumonia. 2) The period the three soldiers enlisted coincided with the Great Flu Pandemic of 1917-18 that primarily killed young people, sometimes within hours of the first symptoms and that many times, the flu caused the lungs to clog with fluids—pneumonia, in other words. 3) Military training camps were perfect for spreading the flu virus. In those camps were thousands of young men training, sleeping, eating, and bathing together. As a result tens of thousands died. In fact, more men died of the flu then died form German bullets. On Memorial Day weekend this year, I cleaned the Garrity Cemetery, cutting invasive Autumn Olive and trimming branches. I also brought some water, soap and a brush and cleaned off Garrity and Reed’s tombstones, so the words etched on them are a bit easier to read. The two men in that cemetery mean something to me now. I know about them. I know their story a little and, as a result, I can imagine the pain their families and friends felt when the boys returned to Clare County in flag-draped coffins just a few months after they left. Those boys are more to me now than names. After all, I know their stories. I know their histories. And that makes them real. That to me, is a big part of what history is about: Making the past live again. I really screwed up. But so did Eddie Bauer as far as I am concerned. In fact, I am so angry at that national retailer that I cut up my credit card and closed my account with them. Good bye, Eddie. Adios. Over and out. I’ve also learned a valuable lesson when it comes to dealing with retailers that issue a credit card through a vendor bank. Don’t. I requested and received my credit card from Bauer a long time ago. The card was only good at Eddie Bauer and carried their name and logo on it. I used the card whenever I shopped there, which was relatively frequently when I was flush with cash a few years back since they had a store in a nearby mall. That was all before my marriage fell apart, I moved three times and I lost my job and was no longer flush with anything except problems and heartache. I kept the card, however. I hoped I might someday be able to use it again. My time of finally being able to use it began earlier this spring. I’m working and although no longer flush with cash, I am able to purchase nicer clothes. This time around it was some much needed dress and casual pants. I went to the E.B. website, logged onto my account (which was still active), updated my address and contact information and placed an order. It was promptly delivered. Also, I started receiving catalogs and other mailers from E.B. Now logic would dictate that since they had my address I would also soon receive my bill, right? Wrong, as it turned out. The bill never arrived. And here’s where I made my big mistake: I didn’t follow up. Although I always pay my debts, I am not the most detail-minded person in the world. As a result, I would think about the bill, wonder why I hadn’t received it, and then would forget about it. After all, why worry? E.B. had my address and KNEW where to send the bill, right? Wrong, as it turned out. I finally got around to calling them last night. Eddie bauer customer service redirected me to what I thought was the billing area where I told my problem to a woman named Melanie. She told me my account was overdue and I was being charged late fees and interest on my purchase, as a result. When I asked her why I hadn’t gotten a bill even though I had long ago updated my address, she responded by saying that I was no longer talking to Eddie Bauer; instead I was talking to some entity in San Antonio, Texas called Comenity Bank. They are the issuer of the E.B. credit card and they are the ones who send the billing statement. The fact I updated my account with E.B. didn’t mean squat to them. I had not updated my address with them and the billing address they had on me was from five years and three moves ago. Melanie was very sweet as she explained how I was at fault in all this. When I explained that I didn’t know I had to update my address with a bank that I didn’t know existed and told her I was very unhappy with Bauer’s and her bank, she invited me to rant and rave if I wanted to. I thanked her but declined her invitation, since it would not change anything and she was not who I was–and continue to be– angry with. She then told me I could mail in a payment and gave me my balance due that included all fees and interest (although she did remove one late fee and saved me $15). She then gave me the address and instructions on mailing the payment to ensure my account would be credited. I did as I was told and the check went into the mail this morning. However, I took one additional step to ensure this never happens again. I enclosed a letter asking that my account be closed and included the cut up credit card (I wanted to cut the card into 100 pieces but restrained myself and just cut it in two). I will never make that mistake again with Bauer and its bank. Fool me once, shame on you; fool me twice shame on me. I then sent a copy of the letter to Eddie Bauer’s customer service department letting them know I have cancelled my account and the reason. Yeah, I should have checked on the lack of a bill long before I did. My bad. At the same time I don’t understand why Eddie Bauer never provided the bank with my new address or at least told me to contact the bank when I placed the order. Their bad. Anyway, I am still angry at this turn of events. The good part is once the payment is credited I will never have to worry about it again. I lost money. Eddie Bauer and the Comenity Bank have lost a customer. What does the couple behind the sliding glass door think when they see me head up the walk to the front door of my apartment building around 5:30 a.m. or so each morning? I’ve just finished exercising. They’re smoking cigarettes. I’m usually clad in my workout garb: shorts and t-shirt in summer with a baseball cap and jacket added in the winter. No long pants regardless of the outdoor temperature. 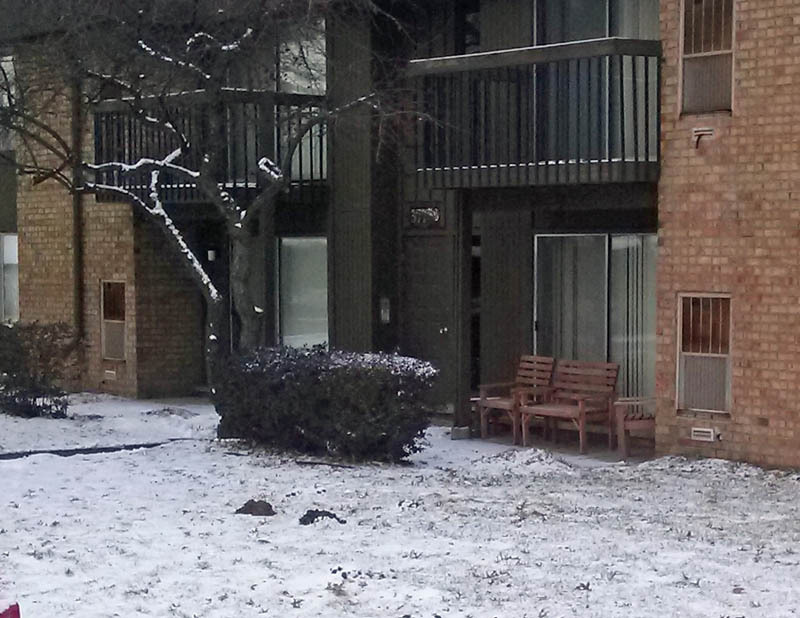 I sometimes can see either the man or the woman seated behind the glass door near the apartment entrance. The door is open just enough to permit an arm and a hand holding the cigarette to extend outside. Sometimes, if it’s really cold, the smoker wears a glove. In any event, the cigarette is outside so the couple does not violate the rule prohibiting smoking inside the apartment. I don’t talk to or acknowledge them as I fumble for my keys unless its summer and the door is open all the way and the figure in the entrance is clearly visible. If they are inside their apartment then I feel they are entitled to their privacy. Yet, they see me and they must know I must see them. What do they think of me or think of themselves as I walk by? Or do they wonder what I think of them? Do they think I am critical of their decision to spend their time smoking instead of exercising as I do? Or are they critical of me for not having enough sense to put on a pair of pants. To be honest, I think how nice it is that they have each other. After all, I am going home to an empty apartment. No one there smoker, health enthusiast or anything in between. Not even a cat. Just me. Not that I mind living alone. There is freedom. Still, there is a certain sadness in not having anyone around to share things with–if not a cigarette–then at least experiences, memories and an occasional bottle of wine. I generally do my workouts around 5 a.m. after coffee, prayer and reflection in the dark of my apartment. The workout room is about 200 yards away from where I live. The walk to the fitness room can be tough since it’s often into the teeth of the wind. The walk back is better since I’ve worked up quite a sweat. I tell people it’s a bit like stepping out of a sauna and then rolling in a snow bank. By the time I get back to my apartment I’m cooler and feel invigorated. Well, except on those steamy summer mornings. I probably also walk back in shorts just to show how tough I am and to let Ol’ Man Winter know he’s not going to beat me. I exercise to help keep my blood pressure down and my stamina up. It’s also an attempt to keep my weight in check, maybe even bring it down a mite (doc says I added about 9 pounds in the last year). And if I am honest, I suppose I also work out to keep in somewhat decent physical shape. After all, I am nearing 60 and no longer (if ever) a prime physical specimen. So I do what I can to remain healthy and keep the gut from getting bigger. So I wish the couple with the cigarettes well and hope they are happy. I hope they wish me the same. Maybe we both know our actions are none to bright and we’re each a bit goofy, which is another good reason not to acknowledge the other’s presence. My hand was gripped by the just born and the soon to die this week. Both grips were strong. Both grips were warm. Both went deep to my heart. I held the hand of a baby girl. It was the hand of Mia, my granddaughter and one of two girls born Wednesday, Nov. 27 to my daughter Kristen and son-in-law, Todd. The girls were born premature and weighed but 5 pounds and change. I touched Mia’s hand on Sunday as she lay in the crib and her warm fingers curled around my index finger and gripped it tight. Where only four days out of the womb did she know to hold onto me? Where only 7 ½ months after conception did she get the strength in that grip? What did she feel as she held my finger? I know I felt a sense of love and awe and wonder. As she held my hand I prayed that Mia and her sister Isabelle would grow and prosper, and I would have the opportunity—the privilege—to hold their hands in mine many times over the coming years. I also held the hand of a dying man. It was the hand of Peter, an 86-year old in a Livonia, Michigan nursing home where I volunteer with hospice patients. According to the information I was given, Peter never married and had worked as a draftsman at Ford Motor Company. He used to enjoy walking, health food and investing in the stock market. Now Peter is confined to bed due to a stroke that has paralysed his right side and taken away his ability to talk. The years have taken away most of his ability to hear. As a result, it’s extremely difficult to communicate with Peter. The staff doesn’t know how much he comprehends and has not been able to help me reach him. Their only suggestion is that I write messages on a whiteboard, as well as talk to him. So I do. Yesterday, I took his hand as I talked. His frail fingers curled tightly around mine and he smiled at me. What did he feel? What did my touch convey? I know I felt a sense of joy and sadness, yet also a feeling of joy that my touch was meaningful to him. I prayed that I might continue to have the opportunity—the privilege—to hold his hand in mine over the coming days and weeks. Mia and Peter both held my hand for only a short time before releasing; yet their touch reached deep into my heart and lingers there still. 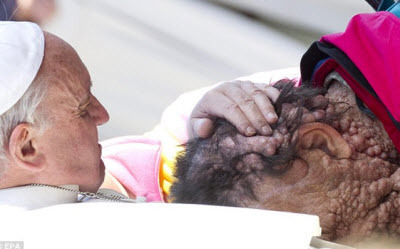 A photo of Pope Francis holding a man with tumors all over his face and head has gone viral as an example of the Pope’s compassion. I too was struck by the photo, but for another reason: Like the man in it, I suffer from Neurofibromatosis. My case is mild. I am blessed in that I don’t suffer anywhere near the physical affliction that poor man has. I can only imagine the looks of revulsion he must get from others. I have tumors but mine are mostly under the skin in my face and scalp and so not as visible. They affect my appearance and I suppose my self-esteem, but it’s not enough to ever get me a photo with the Pope. The photo is also wonderful because it brings additional attention to NF, a insidious neurological disease that can attack nerve cells resulting in blindness, deafness and intense pain to some who have it. In others, there are no tumors but there can severe learning disorders. I was diagnosed with NF in my teens (mid-1970s). I had gone to a surgeon to have a couple of painful growths removed from my face, one up against a bone near my chin and another near my right eye. After the surgery, the doctor mentioned the tumors were neurofibromas, the medical profession didn’t know much about them and (here I pause for effect) he casually mentioned I’d probably get more of them. That was a couple of decades, a couple more surgeries and a 100 or so tumors ago. neurofibromatosis is a genetic disorder of the nervous system, which causes tumors to form on the nerves anywhere in the body at any time. This progressive disorder affects all races, all ethnic groups and both sexes equally. NF is one of the most common genetic disorders in the United States (one in every 2,500 to 3,000 births). The condition affects more than 100,000 Americans; this makes NF more prevalent than Cystic Fibrosis, hereditary Muscular Dystrophy, Huntington’s Disease and Tay Sachs combined. NF has three genetically distinct forms: NF-1, NF-2 and Schwannomatosis. They are caused by different genes and chromosomes. The effects of NF are unpredictable and have varying manifestations and degrees of severity. There is no known cure for any form of NF. NF is not contagious. Approximately 50% of those affected with Neurofibromatosis have a prior family history of NF. The other 50% of cases are the result of spontaneous genetic mutation. If an individual does not have NF, s/he cannot pass it on to his/her children. Luckily, only about 20% of patients suffer from “severe” effects of NF, although severe can be in the eyes of the beholder. When my tumor pain kicks up, which is a couple of times a day, it feels like someone has just stabbed me with an ice pick, I figure I am one of those. Like most of those who fibromas, I take medication to keep the pain under control. Prescriptions I take have changed over the years and dosages have increased to try to keep pace with the number of tumors. Currently I am on Lyrica and gabepentin. They make me tired but help dial down the pain. I manage and I try not to complain. And I count my blessings and pray for the children who have NF and the path they and their families have to journey, especially the ones with tumors affecting their spine, optic and aural nerves or have severe learning disorders. And I pray for people like that man in the photo who was touched by the Pope. Perhaps it was the first time he has been touched in years. You are one of the longest serving congressmen in the U.S. House of Representatives, a man who has been elected to office 25 times in a row (congratulations, by the way). I assume you’ve been reelected because you listen to your constituents. Well, I hope you listen to me. I am a new resident in your district. Recently, I wanted to share my views on the current budget standoff in Washington and the shutdown of our federal government so I went to your website to send you an email. Like most members of Congress, you have an online form one must complete that includes a listing of topics from which I needed to choose. However, Congressman John, where in God’s green earth did you ever get that list that I’ve pasted below? Jazz? Reparations? The four-year-old-and-done-with American Reinvestment and Recovery Act? Toxic Mold? 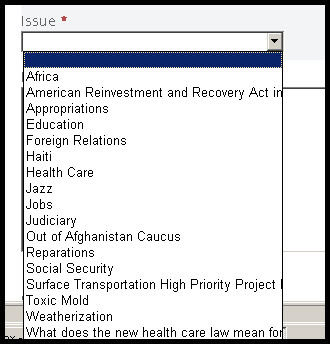 Those are topics your constituents find most important? Jazz, Congressman John? Jazz. Really? You mean no one in your district wants to talk the federal budget, jobs, or the economy? Or is it that after all these years, YOU don’t want to talk about these topics. Please, Congressman John, please update your topics listing on your website. You can keep the fluff in there, if you want. Just add some meaty topics that are in the news. And I know you have plenty of time on your hands to update your site since it’s obvious you and your colleagues aren’t doing anything important right now other than taking up space and collecting a salary. Unless you are working behind closed doors hammering out a national jazz policy. If so, we might not have jobs or a budget and the economy is in tatters, but at least we can swing!